Ah, the flavor of chocolate meeting sourdough. I can’t imagine there is anything else quiet like it. The sourness of the sourdough is a perfect flavor combination with the chocolate. It creates a light and fluffy cake that my whole family enjoys. I like the fact that since it’s sourdough, it’s easier to digest. Even though my son and I have gluten tolerance issues, we can make this and enjoy a small piece without issues, as the souring process helps to break down the gluten. Mix the starter, flour, and the milk together in a bowl, cover, and leave at a room temp for approx 6 hours. Add eggs, sugar, oil and melted chocolate together in a bowl and mix well. Stir in salt, vanilla and baking soda. Add to the soured flour. Bake in preheated 350° oven for 30-35 minutes. Allow to cool completely before frosting. Start by mixing up the coconut creme with the melted chocolate on low, add the sugar and vanilla and mix well. Frost completely cooled cake. This is one of my absolute favorite chocolate cakes, and I miss being able to eat it since going gluten free 🙁 The frosting, however, is completely legal and I could eat that by itself! Thanks for hosting this giveaway! Looks yummy and sounds delicious! 😀 Thanks for posting. This looks delicious. I’m not a huge coconut fan but I’m slowly warming up to the flavor. Wow, this looks delicious! I have big chocolate cake lovers in my house…never tried making a sourdough cake though….and coconut cream frosting? Divine. I will be making this! Wow this recipe sounds fantastic! I am a huge fan of Tropical Traditions but I haven’t tried their coconut cream yet. I may have to break down and order some if I don’t win. 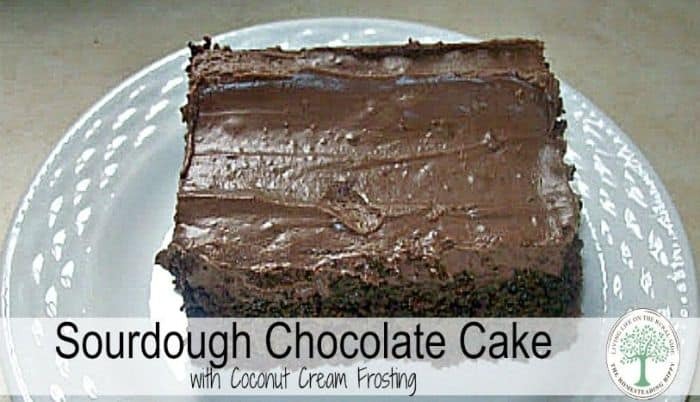 Hey there Homestead Hippy,happy weekend to u 🙂 Wow,this is makin my mouth water mmmmm 🙂 U are an awesome cook,i’d love to make this recipe,my Hubby loooves chocolate and coconut,so it’s perfect! 🙂 Thank u so much for this awesome giveaway,God bless u n urs :)~T.G. Chocolate and coconut oil! I’m in! This looks divine. I’ve been wanting to get into making sour dough! Thank you so much for sharing this delicious recipe! I’m officially addicted! I found that if it’s hotter or more humid outside, I need to chill the frosting longer. Hope that helps!